Catholics believe in Transubstantiation where, during the Eucharistic celebration, the bread and wine become Christ's Body and Blood. A physical change takes place – a change in substance. 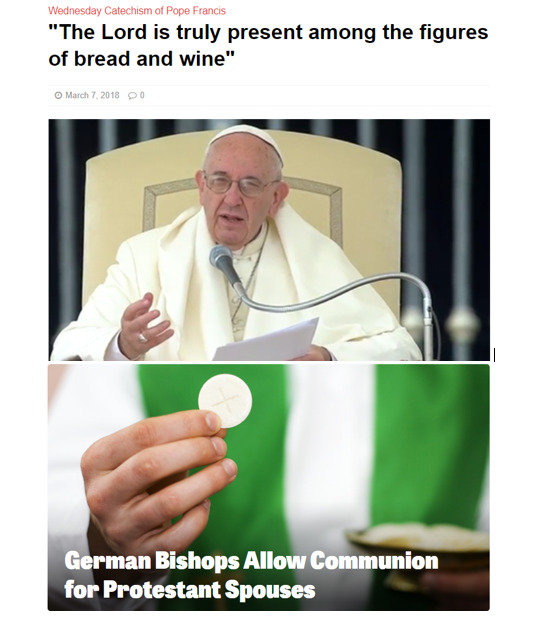 Reportedly last week Pope Francis, speaking about the Eucharistic, said “the purpose of this celebration, [is] fellowship with the Lord, who is truly present among the figures of bread and wine” (https://www.katholisches.info/2018/03/der-herrn-wird-unter-den-gestalten-von-brot-und-wein-wirklich-gegenwaertig/). This concerned me greatly. Seemingly "fellowship with the Lord, who is truly present among the figures of bread and wine" could mean the end of the Mass. This played on my mind as rumours of a new Ecumenical Mass –that may abolish the Sacrifice– replacing the current Mass became very real, based on the assumption that Pope Francis said this. For example, the language is similar to the position of consubstantiation. More than the issue of Transubstantiation, Catholics hold that these non-Catholic Eucharists do not perpetuate the Sacrifice which occurs during a Catholic Mass as Christ's sacrifice is not made present (c.f., 1366, Catechism). Consubstantiation (like Transubstantiation) describes the Real Presence in the Eucharist. It holds that during the sacrament, the substance of the body and blood of Christ are present alongside the substance of the bread and wine. Pope Francis: In this prayer (Eucharistic Prayer), the Church expresses what it is doing in the Eucharist and what is the purpose of this celebration, namely fellowship with the Lord, who is truly present among the figures of bread and wine. The distinction is: Either Christ is present alongside the substance of bread and wine, or present under the species of bread and wine (Catholic). Pope Francis reportedly taught present among which is similar to present alongside. The correct doctrine is "'in the institution narrative, the power of the words and the action of Christ, and the power of the Holy Spirit, make sacramentally present under the species of bread and wine Christ's body and blood, his sacrifice offered on the cross once for all (Catechism, 1353). Adding to my fears was the following article reflecting the latest thinking about who can receive communion. "All steps toward unity between Catholics and Lutherans are tremendously significant"
Going forward, it looks like the German Bishops’ Conference will allow Protestant spouses to take communion in spite of the fact that some traditionalist bishops oppose the move. The two largest churches in Germany are the Roman Catholic Church and the Evangelical Church of Germany, which is a confederation of Lutheran and Reformed churches. As of 2016, the Catholic Church had 23.6 million members in Germany; the Evangelical Church had 21.9 million members. These two churches together represent almost two thirds of Germany’s population. Any type of intercommunion between these two organizations is tremendously significant. If Germany’s Catholic and Lutheran populations work together, they can dominate the politics of the most powerful nation in Europe. Many say Catholicism could split over issues related to divorce, remarriage and intercommunion. But the Bible states that there will be no major schism in the Roman Catholic world. In fact, the Bible forecasts that Catholicism will not only remain united but will actually reabsorb Europe’s Protestant denominations. The German decision exacerbates fears of a “protestantization” of the Mass and the possibility of the Eucharistic prayer being be rewritten in a way that abolishes the Sacrifice of the Mass. This triggered an association of Scripture which I have (falsely or not) paired with the Sacrifice of the Mass, “From the time that the daily sacrifice is abolished and the abomination that causes desolation is set up there will be 1,290 days" (Daniel 12:11). Thankfully my alarm was unfounded. The text was mistranslated and a better translation is found on the Vatican website http://w2.vatican.va/content/francesco/it/audiences/2018/documents/papa-francesco_20180307_udienza-generale.html. A better translation is, “ And in this solemn prayer - the Eucharistic Prayer is solemn - the Church expresses what she does when she celebrates the Eucharist and the reason why she celebrates it, that is, to make communion with Christ really present in the consecrated bread and wine” (Francis, March 7, 2018 ). First. At Mass, if Christ is not present in substance (under the species of bread and wine), the divine sacrifice which is celebrated in the Mass is not offered and Christ cannot be our propitiation (cf., CCC 1367) during that celebration of the Eucharist. Most importantly, the Mass is not a primarily a meal; foremost it is a SACRIFICE.